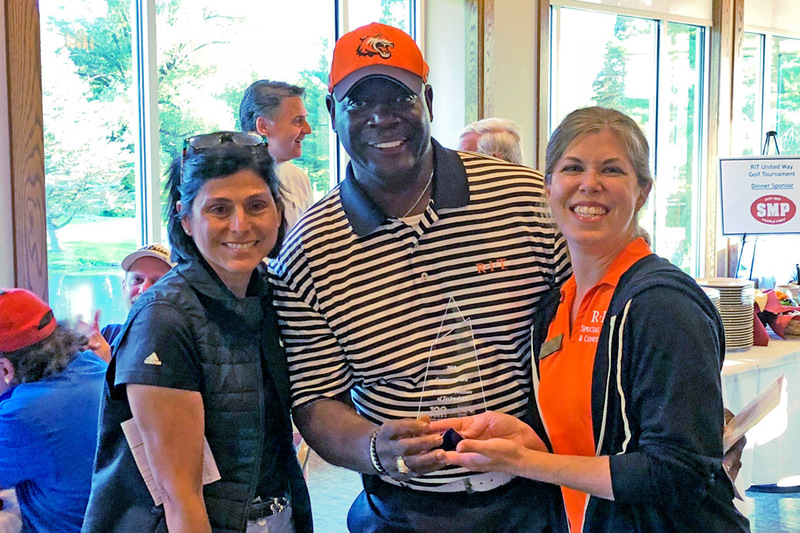 Elizabeth Ciaccio, left, senior director of advancement at the Greater Rochester United way, presents the Century Award to RIT’s Howard Ward and Denise Acton, co-chairs of the RIT United Way Golf Tournament. The award signifies RIT’s 100 years of supporting the United Way campaign. It was more than par for the course at the recent 31st annual RIT United Way Golf Tournament. Tigers set records. The tournament raised a record $12,000 for the Greater Rochester United Way Community Fund. The event — hosted at Shadow Lake Golf and Racquet Club — also featured the most teams (40) and sponsors (18) in the tournament’s history. “This tournament is the official start of the 2019 RIT United Way Campaign and we are excited to get off to such a great start,” said Denise Acton, RIT’s United Way Campaign Coordinator. The Greater Rochester United Way also presented RIT with the Century Award for the university’s 100-partnership in the campaign. The bulk of United Way campaign activities will take place on campus in the spring. Employees can donate at any time throughout the year by going to http://www.rit.edu/unitedway/. The golf tournament in named in remembrance of Joan Stone, former dean of the College of Art and Design, who was a long-time United Way supporter and avid golfer.